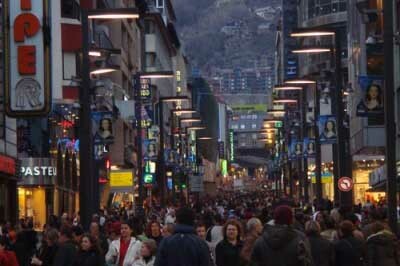 What are the opening hours in Andorra? Opening hours in Andorra are very similar to those in nearby countries such as Spain and France. Malls tend to open from Monday to Friday from 9:30 to 20:00 and Saturdays from 9:30 to 19:00. Small stores and shops have uninterrupted hours. Monday to Friday opening from 9:30 to 13:00 and from 16:00 to 20:00, whereas on Sundays they from 9:30 to 13:00 and from 16:00 to 19:00. Opening hours have been recently widened until 21:00 on Saturdays, days before bank holidays, festivities and times of great tourism. Note that all businesses have some mandatory closing days such as January 1, March 14 (Constitution Day), September 8 (Virgen de Meritxell day, Patron of Andorra), and December 25.